Glass Agencies EROSE are Manufacturer of Platinum Resistance Thermometer. Platinum Resistance Thermometers (RTD'S) provide stable output over the range from 60K to 400K. Units are available in calibrated and uncalibrated versions. Our standard calibration includes the full range from 60K to 400K. - Can be used from very low to high temperatures using a K type sensor. - Displays two channel temperatures and differential temperature. - Can hold and print the data on the site using an IR printer. Enclosure : Die Cast Aluminum. Protection : IP, Flameproof Grade IIA, IIB & IIC. 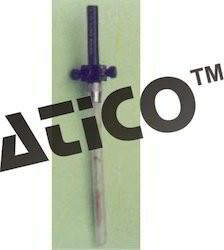 Accuracy : Class A & Class B.
Sensor Element : PT-100 Simplex & PT-100 Duplex.